What do I mean by a Force Field Map? A Force Field Map is a visual “map” of the forces driving and resisting change. If you are suffering like Sisyphus trying to drive Change Management, you need this tool: The Force Field Map. So you can clearly see the best point of attack for effecting change. The Force Field Map is used to help bridge the gap between where things are, and where you want them to be, with less effort. The theory is the balance of supporting and resisting forces is what keeps things the way they are, especially in social organizations. Weaken resistance enough, or strengthen the forces for change and you can tip the balance. and tip the balance with the least amount of effort. 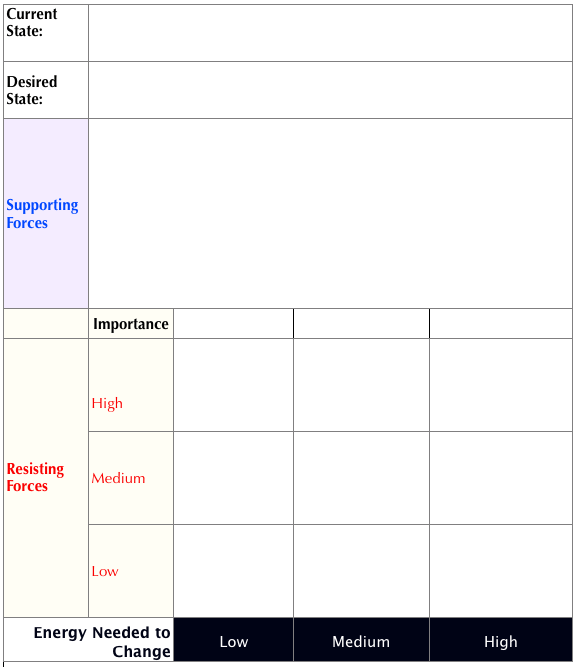 Force field analysis was developed by Kurt Lewin, a social psychologist who created and the Research Center for Group Dynamics at the Massachusetts Institute of Technology in the 1940’s. It takes about an hour for one person to complete a “map,” or about half a day for a team of people. The time invested can save hours of frustration and confusion. If supporting, draw an arrow facing up on the Post-it®; If resisting, an arrow down. Prioritize by the relative importance, and the energy needed to change. The more important and easier should be given highest priority. Rearrange in order of priority. Create an action plan to tip the balance. NOTE: In more complex situations, you may need to separate resisting forces into those that sustain the way things are, and those that constrain change; sustaining is something that is resisting to a lesser degree than things that really stand in the way, like physical laws, vested interests, not yet existing technology. Subscribe and Get Your Own PDF of this Weeks Trick of the Trade, with even more! Sign up for my power packed weekly newsletter and as a bonus, BEYOND the free working secret tools and tips in your mailbox every week, you get a free PDF of this post for you to download.